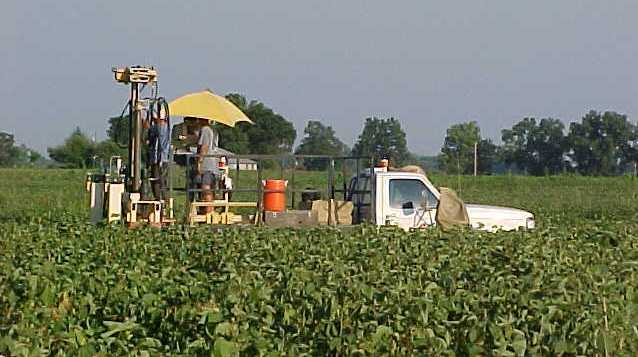 Acknowledgments: This testing funded by the U.S. Geological Survey and Mid-America Earthquake Center. The help of Martitia Tuttle, Laurel Clark, and Buddy Schweig is appreciated. We will also like to thank Toby Walker for providing unlimited access to the test site. This is a paleoliquefaction site under current study by Martitia Tuttle, Laurel Clark, and Buddy Schweig. Evidence of liquefaction by presence of sand dikes has been investigated by geologists using trenching & mapping methods. Several series of vertical resistivity piezocone soundings were conducted in linear arrays away from two large dikes found at the property.